FDA has approved Valturna (aliskiren and valsartan) tablets, which the drug’s maker, Novartis, of East Hanover, N.J., said is the first and only product to target two key points in the renin angiotensin aldosterone system (RAAS). Moderate to heavy ethanol consumption increases the five-year risk, an Australian study shows. Preliminary findings may set the stage for development of a breath test to identify patients with renal failure, according to Israeli investigators. Hypertension rates are expected to rise due to a growing prevalence of obesity and other risk factors. 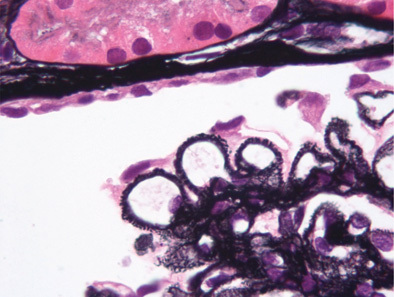 Clinicians should consider the possibility that HIV patients have both renal and cardiac disease. The provision of in-hospital dialysis services over the next decade will necessitate a rethinking of the unit infrastructure. Partial nephrectomy has been the procedure of choice for patients with poor renal function, tumors in solitary kidneys or bilateral renal tumors. Considering the advancement in the diagnosis and treatment of glomerular disease, we formed a Glomerulonephritis Board (GN Board) at Cleveland Clinic that brings together key medical specialists. The electronic medical record (EMR) has enabled creation of a CKD registry, a database that contains demographic information, clinical parameters, and outcome measurements of more than 41,000 CKD patients who have received medical care within the Cleveland Clinic Health System since January 2005.